Flying into Los Cabos International airport, one doesn’t see too much damage from hurricane Odile that hit Baja California Sur on September 13, 2014. However, when you drive towards the hotels and lavish resorts heading towards the Cabo San Lucas Marina, the strongest hurricane ever to make landfall in the Baja Peninsula of Mexico destroyed almost every building with its 125 mph winds. An estimated 92% of the population was left without power or water. It was the biggest electrical disaster in the history of Mexico, according to the Mexican Electric Company (CFE). There were approximately 30,000 tourists in the Baja during the storm. President Enrique Peña Nieto visited Los Cabos three times within two weeks after Odile hit to approve the rebuilding of homes, increase employment to rebuild Cabo, and repair the infrastructure throughout Baja Sur. 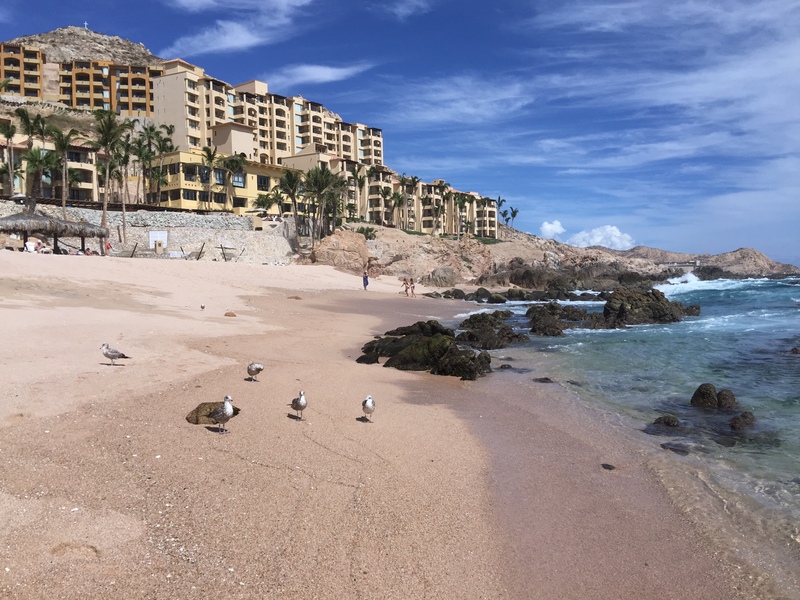 One of the first resorts to open after months of repairing the damage was the Fiesta Americana Grand Los Cabos. 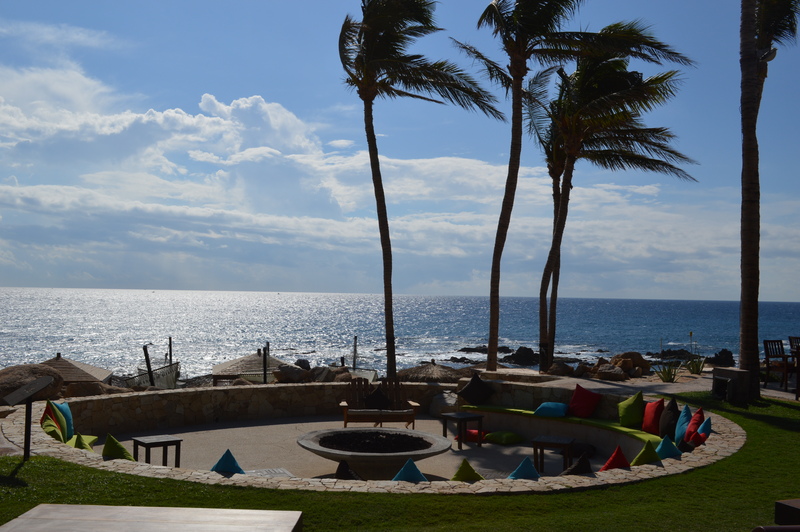 The resort officially opened to guests on November 23, 2014 with new paint, furniture, a new lobby, spa, restaurants and landscape. “There was glass everywhere,” said staff member Pablo, as he took us to our room 1117 during Valentine’s weekend. “I stayed with the guests in the bunker room for days. We had beds, food and a large bathroom for everyone,” said Pablo. Many hotels had backup generators, water and food supplies for guests, but their reserves grew thin as they cared for tourists stranded after the storm. 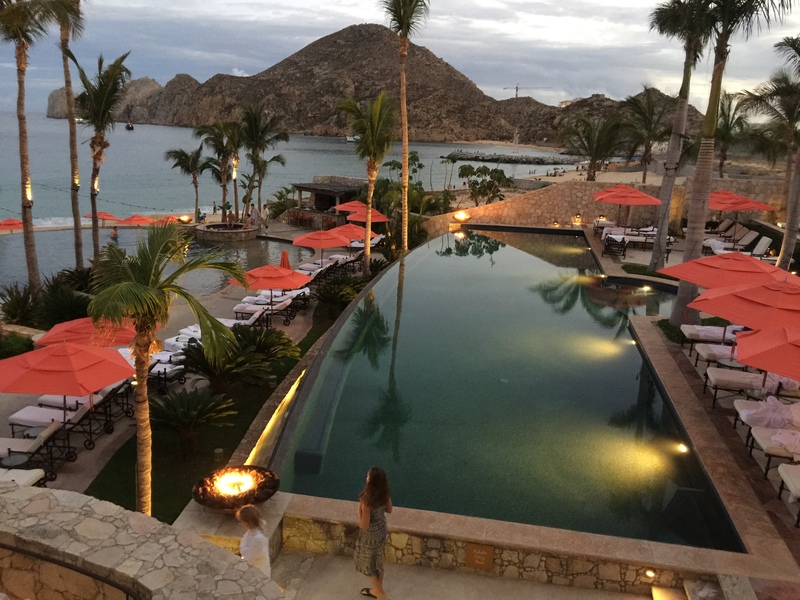 As soon as the airport was deemed safe and available for flights, the guests left for home and crews worked 24/7 to get the Fiesta Americana resort up and running by Thanksgiving, a very busy season in Cabo San Lucas. The Fiesta Americana has 249 guest rooms, seven restaurants, five bars and five swimming pools. The resort offers an all-inclusive option for guests that includes food and beverages. The friendly staff were attentive and catered to all the guests needs cheerfully. They were pleased that the resort was full again. January through March February is an ideal time to visit Cabo to see the migration of the Pacific Gray Whales. Females arrive in the warm lagoons of the Gulf of California to give birth to their young. Every day we looked out along the coastline to see whales spouting water from their blowholes, breaching, splashing, and slapping the water with their tails. Usually there were at least one or two whale-watching boats following close behind. The first night we dined at the handsome La Bodega Steakhouse at the Fiesta Americana for fresh fish specialities and steaks. 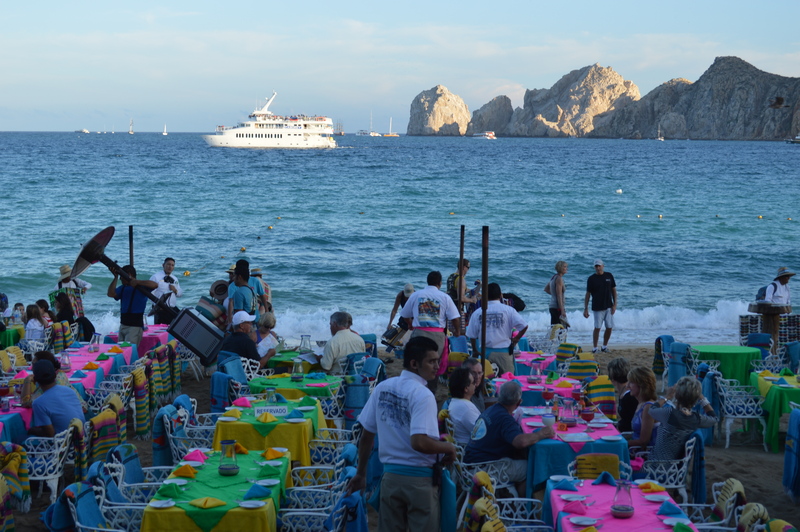 The second night we drove into town to eat at the The Office, perhaps the most famous spot on Playa Medano in Cabo San Lucas. It suffered damage from Odile, yet opened on October 1, 2014. Driving back to the airport to fly home, we noticed that every resort North of the Fiesta Americana were still closed to guests while being repaired. Many restaurants, bars, and shops displayed, “We are now open” signs to alert visitors and locals. Tours and attractions are reopening by the dozens every day. Cabo San Lucas is ready for tourists to visit and enjoy their sun, warm water, whales, beaches, restaurants, resorts, activities and shops. Power, water, internet, telephone and cell service have been back to normal for months. 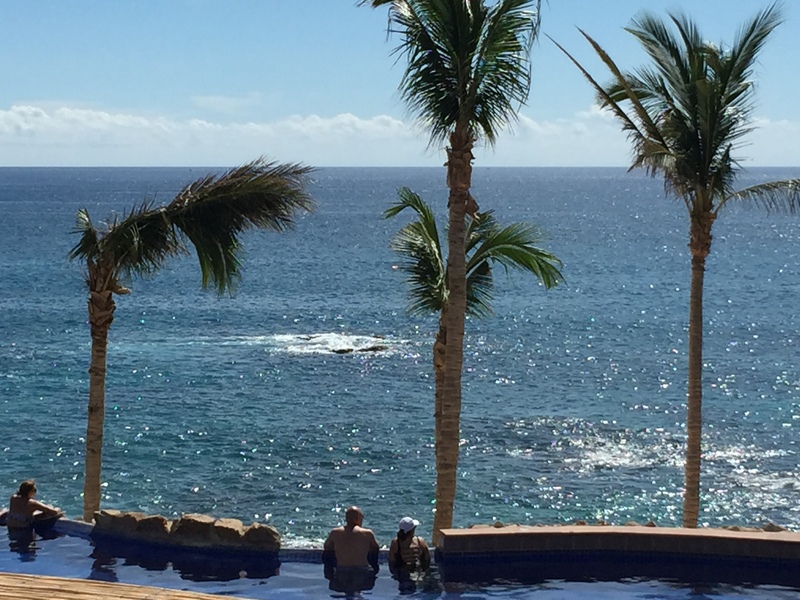 Cabo has bounced back and is now better than ever. This article was published in the March issue of NOT BORN YESTERDAY. It was also shared in the Cabo Times Daily News.